The light of our lives is gone. Casper went to the rainbow bridge Sunday morning. He never gave up but his body just was not strong enough. We are heartbroken beyond belief. He was the best boy anyone could ever hope for. We feel blessed to have had him but his time with us was just too short. I don't think any amount of time would have been enough. We are thankful we were able to bring him home. He was happy here and we did not want his last days to be in a hospital. Casper never wavered. He wanted his Mommie and Daddy next to him at all times and never gave up. His spirit and determination is an inspiration. We will never forget all the things he taught us. He is and forever will be our Superdog. To everyone, thank you for all the notes you have left for us via his Facebook wall, pm, emails, letters, cards, etc. It is a comfort to us and it is heartwarming to know how much he meant to you all. He was just so special and truly, he belonged to us all. Here are a few pictures of him during his last days. Always such a happy boy all the way to the end. 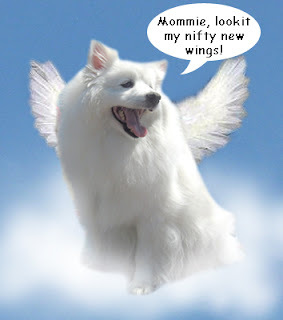 We imagine Casper in heaven proudly showing off his new angel wings and saying hello to everyone there; entertaining them all with his antics. Please pray for Casper. He is currently confined to the hospital. Both his platelets and red blood count have dropped further. His legs were weak this morning and he did not want to eat or drink. The doctor said he has a high fever and an infection and his liver is failing so they are treating him at the hospital but we cannot bring him home. When I heard the delivery man ring the doorbell, I opened my mouth but instead of my usual Superbark only a pathetic sounding woof came out. Waahh! My Superbark is gone. This must be how Bolt felt like when he lost his powers coz of the styrofoam peanuts. I got a red spot on my belly today and the wound in my mouth and tongue are still there. I go for another bloodtest on Tuesday. I wish I can get better soon. I hate taking so much medication and don't like my mushy food and bad poopies. I have not been interested in my toys for days. Mommie promised to make me chicken and rice tomorrow. So that is something to look forward to. Both Mommie and Daddy are down with the flu so it's been a pretty gloomy household.